Two Toned Lips: Thumbs up or down? Today’s giveaway is from Nadine Essra, a fine art and jewelry design shop based in Tel Aviv. Nadine specializes in custom and unique jewelry and her shop is full of beautifully handcrafted necklaces, rings and bracelets. She is offering you a chance to win this amazing necklace from the Juicy Series with a customized stone colour. 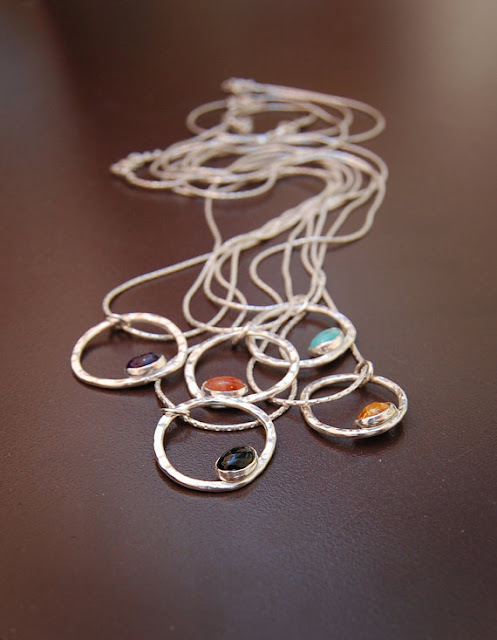 You can choose between 13 different stones, from Sunstone to Agate and even Turquoise! My favourite is the Moonstone (what's yours?) and I would wear it with a crisp white shirt, skinny jeans and a bit of red lipstick! Follow exPress-o on Twitter, like Nadine Essra Designs on Facebook, join the exPress-o group on Facebook, tweet about the giveaway or post about your favourite piece from the shop and please make sure to leave a separate comment for each entry. I LOVE the black pebble necklace. Belong to the facebook group. So fun! I'd love an agate piece! Of course we're tweeps darling! I adore Sterling Silver and Red Jasper Ring. so unique! I'm in love with the Carnivorous Plant No.1 ring! I really love the necklaces and I'd want one with an Aquamarine stone or Peridot. sigh. Such pretty pieces! I love the Manatee Silhouette Necklace and the Juicy Series Necklace in Turquoise! Such a beautiful design! I want the silver & aquamarine stackable twosome ring. Beautiful! I follow exPress-o on Twitter. apart from the necklace I really like her silver stacking rings... very nice! oh I love the stackable rings!! GORGEOUS!! Very talented artist! Loving the brass pendants! Diana I love the Kinetic Jasper Silver Neckalce, Very nice! I love anything from the Juicy series and the stackable rings. What a great artist. Of course I follow on twitter darling. Liked Nadine Essra Designs at Facebook. 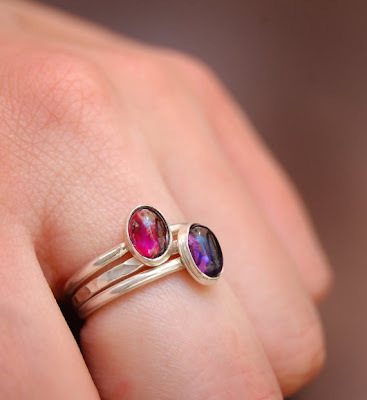 if i have to pick i would pick the juicy stackables gemstones trio, so perfect. You really do have the best giveaways! The moonstone sounds lovely. i really like all the juicy stackables! gorgeous pieces-love those manatees! so excited to see something like that! just liked nadine on fb. Just liked Nadine Essra Designs on FB! What a darling giveaway, Diana! Loving her ring collection and the Golden Skinnies! What an awesome giveaway! These are just so pretty!! Very hard to choose but I love the arm curls. Follow you on twitter. tinatre01. OMG that necklace is beautiful. Please count me in. My favorite piece is the Silver Ouroboros Ring - so simple and classic yet unique! Enter us please. This necklace is gorgeous. I would like the moonstone or the turquoise the best. I really love the matter copper curl bracelet too. I love the Juicy Stackables- Gemstone Trio. Grea colours! Just gorgeous stuff. I love the Silver Ouroboros Bangle..so pretty! I follow expresso on twitter! I am a part of the expresso group on Facebook! Have a lovely day! the sugar plum fairy ring is gorgeous! i love the stone necklaces, so original and earthy. i like orange and yellow. Gorgeous designs. Adore the necklace you featured here! oh I love all of the colors but i agree the moonstone is gorgeous. Red lips and stripes just might be your trademark. Also loving receiving you blog post in my inbox every night and have been for a while. I LOVE the river pebble necklace! Lovely! I like the Brass Ouroboros Pendant! thanks! Love the necklace in turquoise or maybe aquamarine! i am SO in love with the golden skinnies!! Such gorgeous jewelry!! I love the turquoise - i can't get enough of it! I love the little black cocktail ring! So pretty! i want to enter this giveaway!!! Sweet - Love the Brass Ouroboros Pendant! I love the Silver Stacking Rings. I'm a follower! Cheers to a great weekend Diana. I'm in love with the funky Cleopatra Bangle! So chic!